Our goal is to enhance our worship and enrich life in our community through expression and beauty of music in order to engage members of our Parish. Our hope is that meaningful sacred music will foster a fellowship among the parishioners and provide spiritual inspiration through the beauty of music. The St. Anselm Church Choirs lead the assembly in singing and provide music at the 5 p.m. Saturday Mass and the 11 a.m. Sunday Mass. The choirs also contribute to Parish celebrations of major church feasts and solemnities. Join us to explore a wide variety of hymns and choral compositions and to have an opportunity for vocal training and learning music fundamentals. No audition is required, and minimal choral experience is helpful but not necessary. All are welcome! For more information, please contact Dr. Andrzej Zahorski at zahorski@stanselmstl.org or 314.878.2120, ext. 14. The music for the Sunday 10:30 a.m. Family Mass and the 5:30 p.m. Youth Mass is geared toward those age groups. For more information about the music or to volunteer for this ministry, contact Carmen Hinze, Youth Music Minister, at carmenhinze@gmail.com. These Masses are in the Parish Center Worship Space. The organ, located on the west side, is a classical tracker-action pipe organ and technically and tonally based on traditional European principles of organ building. Organs of this type are built with a series of features found in the classical organ of Central Europe, but forgotten or discarded in the instruments built in the nineteenth and early twentieth centuries until they were recognized anew after the early fifties. 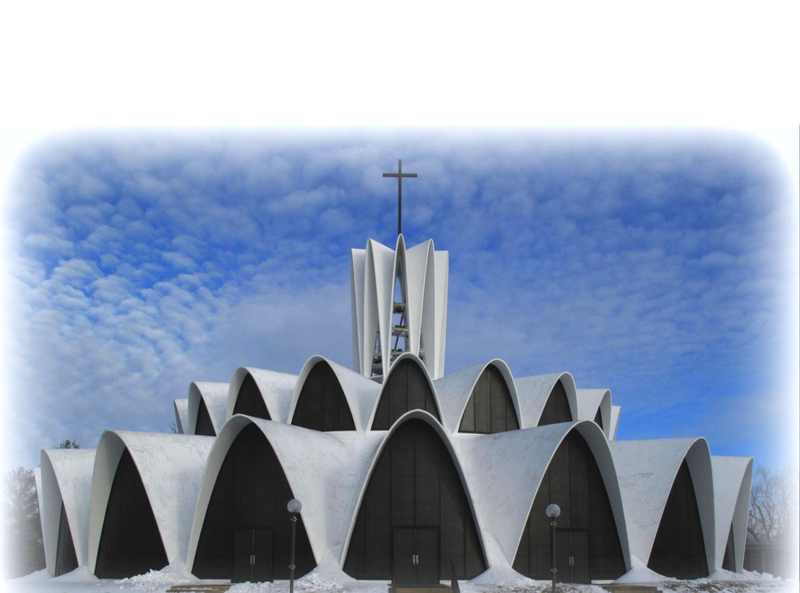 Relive the magnificent 50th anniversary of the St. Louis Abbey Organ here, with the Hradetzky 50! The nineteen speaking stops contain twenty-eight ranks on the two manuals (keyboards) and pedal, comprising more than fourteen hundred pipes made of tin and finest mahogany. The instrument was constructed and built by the organ builder Gregor Hradetzky of Krems near Vienna in Austria and shipped and assembled in the summer of 1967. It was one of the first tracker-organs in the Saint Louis area and the first of twelve Hradetzky instruments built for the United States. The very first feature of such classical principles is the so-called “mechanical tracker action.” Through very fine wooden and metal links connected to the keys, the organist has ample control over the speech and articulation of the pipes rather than dealing with the mediation of pneumatic or electronic devices. Furthermore, the divisions of the organ – the great manual, the swell manual and the pedal – are independent ensembles which can be played individually (trio-like), or coupled for full sounds organo pleno. The organ was assembled, voiced and tonally finished by craftsman from Austria and dedicated on September 7, 1967.